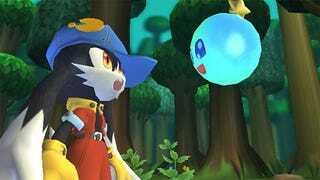 Klonoa: Door To Phantomile, in its PlayStation incarnation, is now almost 11-years old. In its remake journey to the Wii, it's been surprisingly unfucked with. There's no waggle gimmick — at least not in the portions of the Tokyo Game Show demo we played this week — with the only major change being a serious step up in graphical fidelity. It's a fantastic looking Wii game, looking better than the proper PlayStation 2 sequel, Klonoa 2: Lunatea's Veil, but dropping that game's cel-shaded look. If you've never actually played the console Klonoas, as I was shocked to find my fellow Kotaku TGS crew hadn't, you really should. Really.Klonoa's a fairly stock platformer. All you do is jump and grab and throw enemies. But what you can do with those enemies, using them to boost your jumps to higher platforms or smash open bubbles with power ups inside, is what makes Klonoa such a good puzzle-platformer. And even though Klonoa is a 2D platformer, the titular anthropomorphic furry can toss bad guys in three dimensions, into the screen or outward toward the camera. Klonoa just doesn't walk left to right, but typically spirals around levels or weaves through turns, hopping up and across tilted platforms, crossing gaps with a helpful float from his floppy ears. It never feels flat or too repetitive. Namco Bandai's level design was top notch in 1997, but the game still feels fresh. Control is tight as a drum on the Wii Remote, which is held horizontally and uses nothing but the cross pad and the 1 and 2 buttons. If nothing else, Klonoa is an opportunity to play — or replay — a classic platformer that very few had the opportunity to experience on the PlayStation. It's due to hit the Wii in Japan this December, but its fate elsewhere remains a mystery.